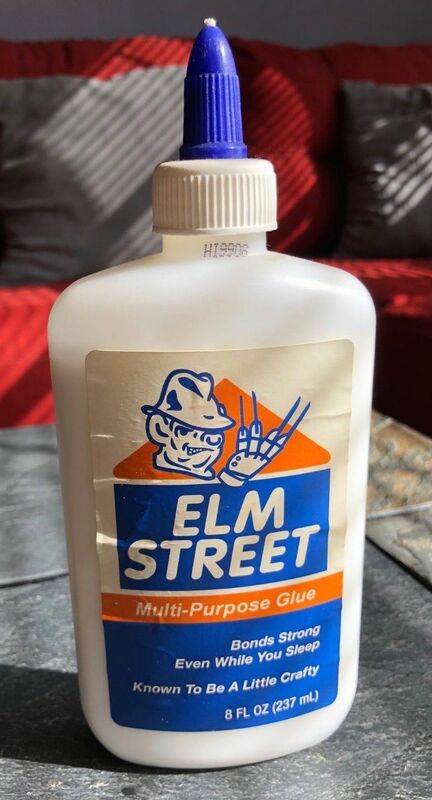 Ebay Find Of The Week: ‘Elm Street’ Unofficial Glue! Glue: The underrated holiday gift. Think I’m kidding? Hardly. I’m not horsing around and if you’re finding yourself in a sticky situation regarding those holiday gifts this year…….then a strange eBay listing has come to the listing. Behold: The unauthorized A Nightmare On Elm Street glue! Oh, and it’s ‘multi-purpose’! Just don’t eat it. So anyway, yes – this is an actual thing. And if you go on over to the eBay listing right HERE, then you can learn more about it. There is some pretty nifty stuff on the back of the bottle having fun with the whole “1, 2….Freddy’s coming for you” rhyme. While this is some rather expensive glue ($27), I have a feeling that the horror fan in your life might be ok with this being stuffed in their stocking. Happy Holidays!